It's Wednesday, which means it's time again for our weekly installment of new arrivals. For today's roundup, I've searched high and low to find the best in designer and fast-fashion pieces—all of which just hit stores—so that you can be the first of your friends to wear them. After all, if you’re going to buy something, why not beat everyone else to it? From dresses and skirts to shoes and shorts—so many shorts—I have something for every style type and price point, all of which have me so excited for spring. Now you just have to narrow down your favorites and make room in your closet—sorry! So what are you waiting for? Shop my picks of the week below, and don't forget to check back next Wednesday for another batch of fresh fashion finds. 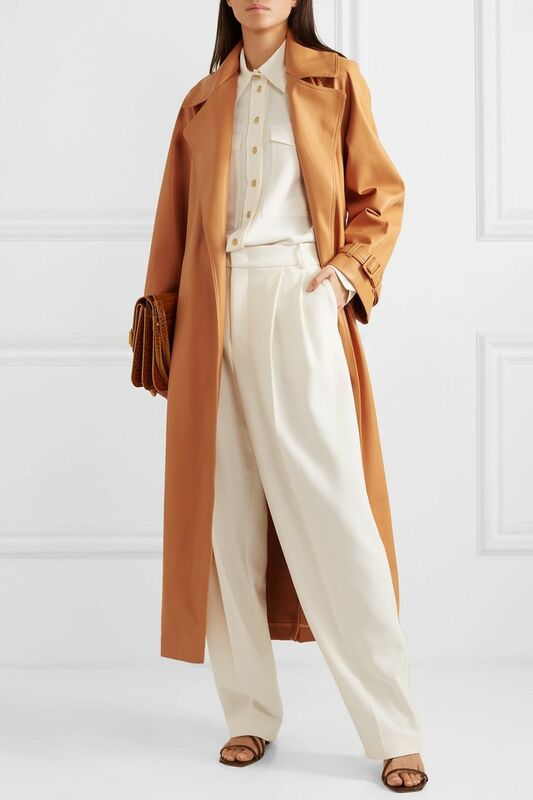 How luxe does this faux-leather trench look? These ultra-high-rise dark-wash jeans are practically begging to be worn with your favorite new crop top. I love a piece you can wear two ways, and this vest can be worn like above, or as a dress. Why settle for a basic blazer when this exists? Not over hair clips quite yet. An everyday bag that will make all your outfits more interesting. Add this to your weekly wardrobe rotation in place of a basic tee. Too pretty to pass up. Is it too early to call this a great Coachella dress? I just love this print. The unofficial Sunday brunch jeans (ideally paired with a sweatshirt or tie-dye tee). Spring is almost here, and this looks like the perfect party dress. Love an easy day dress. I love an outfit you don't have to think about but will look so cool in. I have no words for this, honestly. Shorts weather is almost upon us, people. Tackle two trends in one with these tie-dye bike shorts. In case you haven't caught on, shorts of all kinds are trending hard for spring. Word of the day: Shootie. I'm oddly obsessed with these statement heels. Anyone else? Want more? Shop last week's new arrivals.